A few further thoughts about different perspectives on the floods. As recorded on an earlier page, it all looked normal in large areas of the city and its suburbs, even though it was a different story in other areas. But, as I feared, news reports on the situation meant I had worried relatives fearing the whole city was underwater. Presumably because of that same reporting there are people on Twitter who don’t live in York having a go at Rachael Maskell MP (York Central) and city council leader Chris Steward for stressing that the city is ‘open for business’. Though Rachael Maskell and Chris Steward have been out there dealing with the situation on the ground the Twitter commentators from far afield seem convinced they know better what is happening in the city – that it’s all underwater, etc – apparently from reading media reports. I’ve been wondering how I might have seen the situation if I’d relied on social media and the internet in general rather than living here and walking about. To begin with, my main information on the worsening situation with York’s rivers came via Twitter. On Boxing Day I noticed striking images of floodwater on Huntington Road. It is low-lying in that particular area, and is right next to the Foss, and as I recall has flooded quite often. I tried to get more information, then went for a wander up there to have a look. There were people saying that they’d ‘never seen it this bad’, and I found myself going to check their profile details and photos to see if I could gauge how old they might be, or how long they might have been here – because ‘never seen it this bad’ wouldn’t be so significant if they, for example, were a student, maybe here quite recently, in recent years. If someone in their 80s says they’ve ‘never seen it this bad’ then clearly that’s more worrying. ‘How bad is it?’ I thought more and more as more and more people seemed really worried. I’ve lived here a long time, and seen many floods, and read a lot about earlier floods, seen a lot of photos of earlier floods. I handled the worry and concern by leaning on reassuring historical perspective. And hoped that the true picture would become clearer, and be properly and responsibly reported. But of course news doesn’t work like that. News is about dramatic things, about reporting it as it happens, and focusing on the catastrophe, not the context. So certain language is used, and photos are framed in a particular way, and all of it presents a dramatic picture of the crisis, but misses out the context and doesn’t care about the bigger picture. Which means people worry, and panic. The way photos are framed is important, and the way they’re presented. At one point, looking at photos on Twitter, I thought that the Groves area (between Huntington Road and Haxby Road) was flooded. (It’s on higher ground than Huntington Road itself, which is right next to the Foss.) 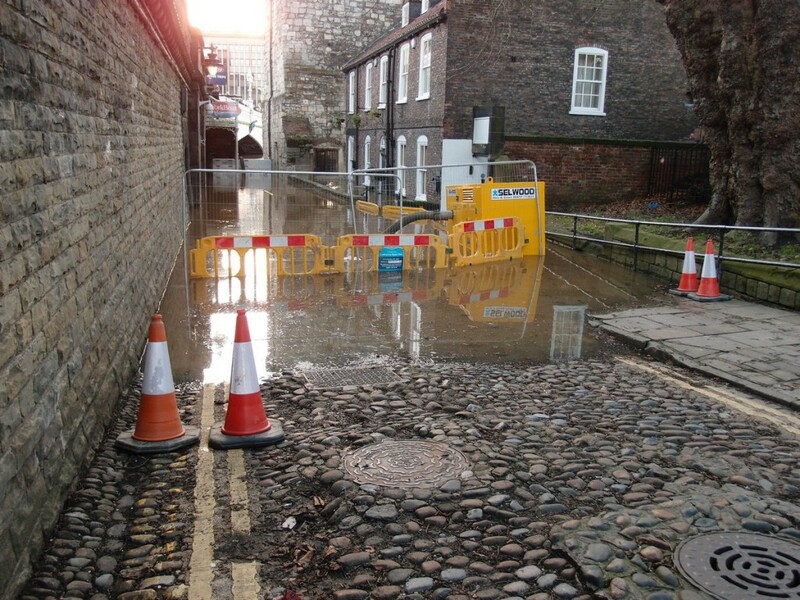 Another photo and associated comments suggested that the flood defences at the edge of the Marygate car park had failed and that it was covered in floodwater. It wasn’t, it was dry, with the water held back by the walls and gates just as usual. But when I was down there in the Marygate area I took some photos. They perhaps illustrate the different ways of framing, and how images of the same thing can give different impressions from slightly different angles. I took these images seconds apart, standing by the crucial flood wall and gate by Scarborough Bridge. 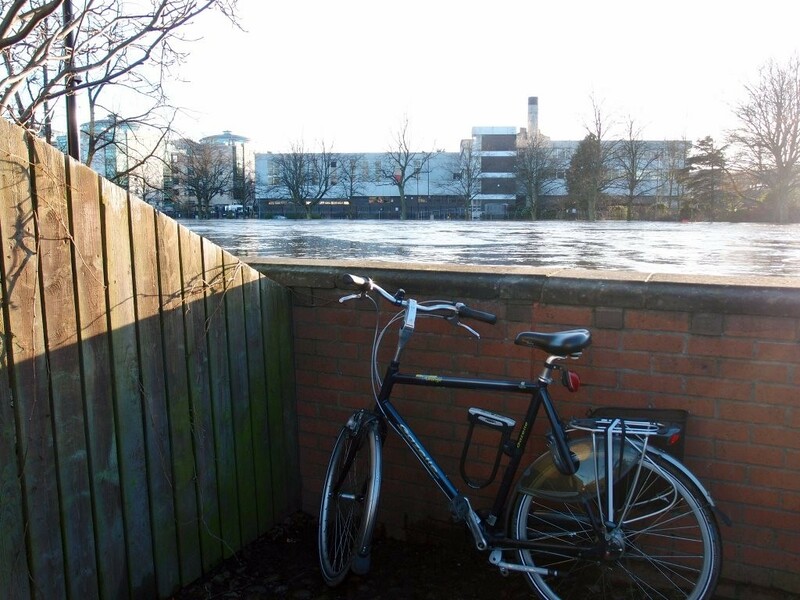 The first shows the flood water of the Ouse dramatically high, as if about to overwhelm the defences, as if it’s at the same level. I then moved to the side of where I’d been standing, and held my camera over the same stretch of wall (and river) and pointed the camera towards the back of that wall. And as you can see, it’s some way off overtopping the defences. Far more so than the first image suggests. If I’d been a news provider I guess I would have gone for the first photo. But I’m not, so I used the second one. Why does it matter? Because it’s about providing clear and balanced information, even in times of crisis. Because city centre businesses probably can’t afford to lose a lot of customers who would have been coming in to town but have been scared away by thinking that the whole city is submerged, or that all the main roads in are impassable. Because my relatives were worried, so presumably you, dear readers, found similar worry. And I think we’ve all got enough to worry about already without misinformation or skewed reporting making it worse. This city floods so often, to varying degrees. It seems that we’re still struggling to present that accurately and in a balanced way to the outside world, and to local residents. We’re now in the aftermath (I hope, hoping that recent rains won’t have raised the levels high again) and we’re back in that usual thing of people arguing over whether York is ‘open for business’ or not. Part of it never closed for business, as I hope I demonstrated on my Sunday walk. Yet trusted authorities started telling people not to come into town. It seems that they meant ‘don’t try to drive into the city as some major routes are flooded’. But other major routes weren’t, and in any case many of us were walking (or cycling). 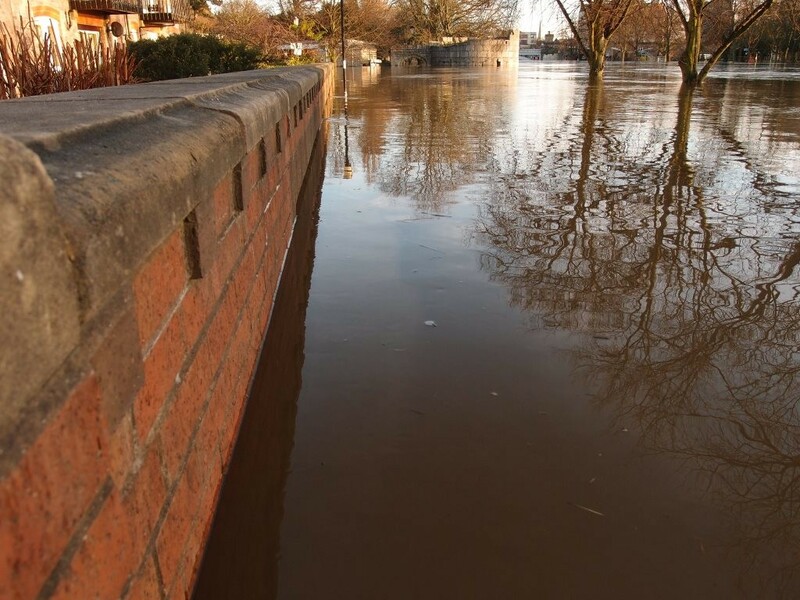 This problem is going to keep happening, York will keep flooding, nothing can stop that, and every time there will be more and more people posting photos and commenting – a flood of information following the flood itself. And it will confuse people, as it has this time. How can we better manage the flood of information, and make it accurate and helpful? How can we support the city better, the traders who are still trading, the residents who need to know that their bus route will take them into town to shop at those shops and visit the restaurants? I hope it will evolve, become more balanced and properly represent the situation at the crucial times, because although these floodwaters will recede, it’s only a matter of time before the next flood, isn’t it.